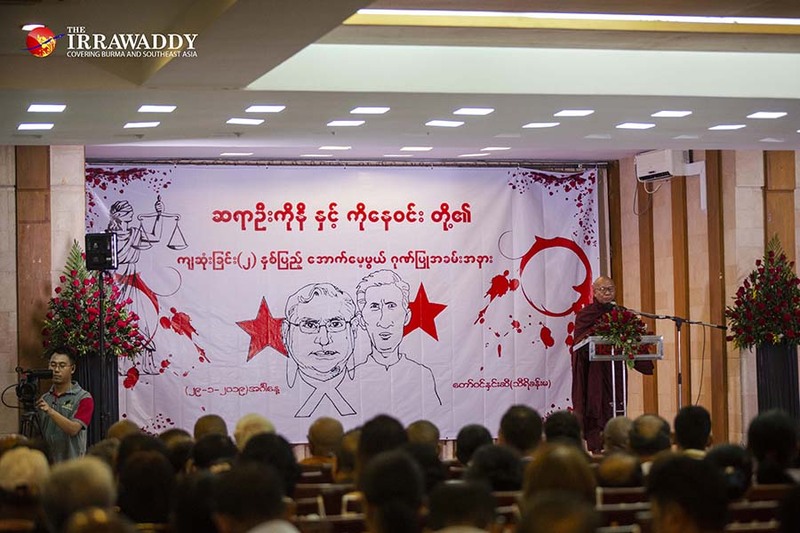 YANGON —State Counselor Daw Aung San Suu Kyi urged authorities to find justice as soon as possible for prominent constitutional lawyer U Ko Ni and taxi driver Ko Ne Win, two years after they were gunned down in Yangon. However, the suspected mastermind of the assassination, Aung Win Khaing, remains at large. During Tuesday’s commemoration, U Ko Ni’s daughter, Daw Yin New Khaing, said two years was more than enough time for a trial. “I pray with anxiety that the judicial sector, which he valued and respected, can provide him with the truth. I want to get the most honest answer from the judicial sector,” she said. NLD spokesman Monywa Aung Shin called the murder of U Ko Ni a political assassination targeting the ruling party. “We have lost a person who was resisting those hampering the NLD’s efforts to amend the 2008 Constitution,” he said. Coincidently, the NLD submitted an urgent proposal to form a constitutional amendment committee to the Union Parliament on Tuesday. Despite strong objection from military lawmakers, a debate on forming the committee was approved for early next month.